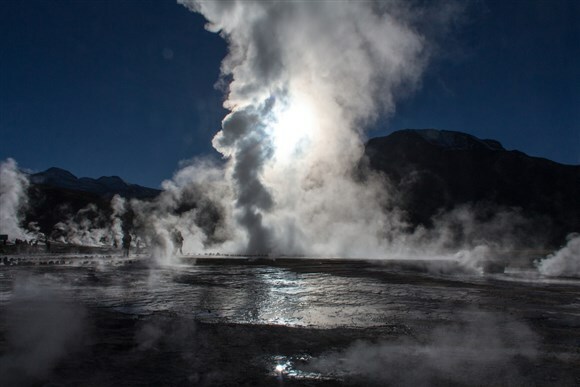 Our trip to the highlands begins during the early morning hours to reach one of the most important geothermal fields in the world, Tatio Geysers (4,321 MASL *). This geothermal center contains geysers that can only be seen in the early morning. The geysers are surrounded by bubbling hot water and steam. Here we enjoy the beauty of the Andes. At 4200 meters above sea level, the Tatio Geysers welcome us. The El Tatio geothermal field comprises an area of ​​10 km2, composed of thermal springs and sinter terraces, located at a height of 4,290 m.s. what positions it as the highest geothermal field in the world. The Tatio has about 80 geysers, approximately 8% of the existing ones in the world. Despite the number of geysers the eruptions are not very high, reaching an average of 76 centimeters. The water emerges at about 86 ° C, which is its boiling point at this height. It is estimated that the place is visited by about 100,000 tourists every year. The water deposit is inside the volcanic rocks, covered by waterproof layers; the faults drive the hot water to the surface. In front of us and between fumaroles up to 10 meters high that unfold gloriously on rocks and volcanic rocks. The opportunity to try those waters still exists and to take advantage of it, we go to the natural pools that are in the vicinity. Already immersed in these exquisite hot springs, we free ourselves from the cold and enjoy the landscape that houses the largest group of geysers in the southern hemisphere and the third largest in the world, after Yellowstone (United States) and Kronotski Nature Reserve (Russia). Want to explore doing hiking and photography tours? Contact Us!